At Loomis there is no limit to your equine involvement. In conjunction with ABF Equine, students are given the opportunity to board, lease, or simply take weekly lessons on our show-quality school horses. Riders are required to take three lessons per week and to be on the Loomis Interscholastic Equestrian Association (IEA) Team although we have options to suit every rider’s needs, including those riders looking to compete outside the IEA. From schooling shows and nearby clinics, to AA-rated shows throughout the country, Loomis encourages our riders to strive for their highest goals and beyond. Our trainers are accomplished professionals who help every rider achieve excellence. We strive to improve horsemanship skills while promoting good sportsmanship and team camaraderie. Our Loomis equestrian team riders are hard-working and dedicated to their equestrian pursuits, and we welcome you to join our tight-knit team of riders. Follow Loomis Equestrian on Facebook. On Saturday, October 27, the Loomis Chaffee equestrian team traveled to Stoneleigh-Burnham School and won their third consecutive horse show of the season. Despite the cold weather and rain, the team was in good spirits and started the day off strongly. The equestrian team won its second consecutive horse show on Saturday, October 6, thanks to impressive efforts from team members in each division of the show, which took place at the team's home barn, ABF Equine. 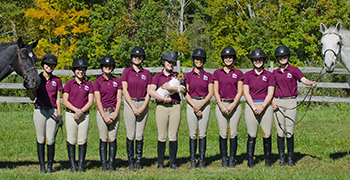 The Loomis equestrian team got the season off to a strong start by taking first overall at the opening Interscholastic Equestrian Association show of the year hosted by Holiday Acres in Rutland, Mass., on September 22. The Loomis equestrian team hosted their second home show at ABF Equine on November 4, and pulled out an impressive first place finish out of eleven teams. It is their second first place finish this season, and they have yet to lose at their home barn.